Dual port commercial and public EV charging station. 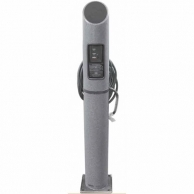 Includes galvanized steel bollard and a 23 foot charging cords. 1. What is an EV Charging Station? An EV charging station is an electric vehicle charging station. Other common names are 'electric recharging point', 'charging point' and 'charge point' and is designed to charge electric vehicles - functionally similar to a gasoline pump for gasoline vehicles. 2. Is it weatherproof / waterproof? 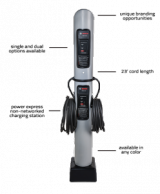 Ideal Shield's Electric Vehicle Charging Station is built to NEMA 4X rating, making it weatherproof and ideal for indoor or outdoor installation. It can be charged safely in any environment. We recommend working with an experienced electrician to install your charging station. 3. What are the basic specifications? 4. Does the unit need to be installed by an electrician? The unit will need to be hardwired by an experienced electrician. You can find installation details here. Electric Vehicles are booming and the demand for charging stations is high. If you want a charging station for your own company vehicles, customers or to attract people to your business who are using using locator apps to find places to charge up then check out our offerings. A competent electrician can install easily install these units, and you might even consider adding a coin operated or manual timer to help limit usage or collect revenue. An EV charging station may not be a fit for every facility but if you have room, and can work it into your marketing plan, it can be a powerful value added feature and an incentive for vehicles to stop at your location.